The first product to come out of Rivet Networks' new partnership with Intel, the Killer Wireless-AC 1550 is the world's fastest 2x2 11ac wireless networking adapter. The Killer Wireless-AC 1550 has been designed to combine the speed, intelligence, and control of Killer Networking products with the power and performance of the latest Intel wireless chipset. Delivering faster than gigabit Ethernet speeds along with the gaming functionality that gamers love, the Killer 1550 is the ideal wireless networking product for competitive gamers and performance users who demand the most from their computers. Gigabit Wi-Fi Speeds: The Killer Wireless-AC 1550, featuring 160 MHz channel support, has a theoretical max throughput speed of 1.73Gbps when connected to a router that supports 160 MHz channels. This is faster than gigabit Ethernet and twice the speed of standard 2x2 11ac products. MU-MIMO Support: Killer 1550 includes full MU-MIMO (Multi-User-Multiple Input and Multiple-Output) support, which dramatically increases network efficiency by working with a MU-MIMO enabled access point. MU-MIMO allows wireless access points to support multiple transmissions at the same time, versus a single transmission at a time like normal access points. This creates additional efficiencies that can provide up to 60% faster download speeds, lower latency, and a better overall connection. Transmit Beamforming Technology: Killer 1550 also has Transmit Beamforming technology, which allows the Killer Wireless-AC 1550 to share location information directly to your wireless access point so that the access point can better direct its signals to you. This creates stronger wireless signals at all ranges and faster data transfers. Complete 802.11ac functionality: Supports dual band (2.4 GHz and 5GHz), IEEE standards-based 802.11a/b/g/n/ac, and includes Bluetooth 5.0 connectivity. Replacement for Killer Wireless-AC 1535: The Killer Wireless-AC 1550 delivers up to 1.73 Gbps of throughput and is the ideal networking solution for gaming, streaming, and downloading. 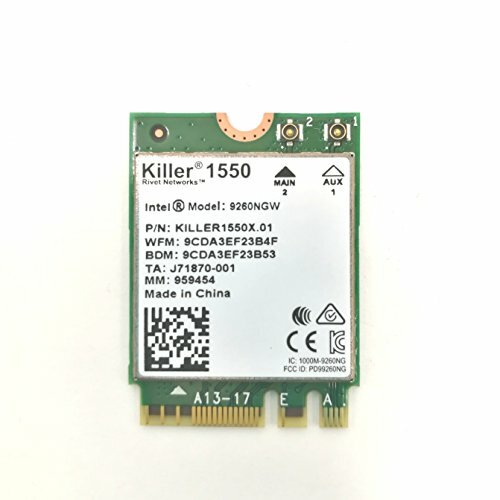 The Killer 1550 supports advanced 802.11ac Wave 2 features including 160 MHz channel support, and can drive twice the throughput of what standard 2x2 11ac adapters can deliver. Advanced Stream Detect 2.0 Technology:Killer 1550's Advanced Stream Detect 2.0 Technology automatically detects, classifies, and prioritizes critical network traffic for online games, streaming video, and high-quality audio to ensure a smooth and enjoyable gaming and entertainment experience. Lag and Latency Reduction Technology: The Killer 1550 features Lag and Latency Reduction Technology that is designed specifically to improve online gaming and streaming video performance. Through its patented technology, Killer is able to get network packets to your applications much faster than competing products. Killer Control Center: Killer's state of the art interface gives you the visibility and control needed to perfectly manage your PC's network traffic. The Killer Control Center shows which applications and websites are using your bandwidth, and gives you the ability to optimize performance by adjusting priorities and setting bandwidth limits so that low priority traffic won't interfere with your games, multimedia applications, or favorite websites. Killer DoubleShot Pro: The combination of the Killer Wireless-AC 1550 and a Killer Ethernet controller gives users unprecedented speed, intelligence and control of their PC's networking. Killer DoubleShot Pro automatically picks the fastest network connection and sends all high priority traffic over that interface and then sends less urgent traffic over the other interface. This ensures the highest priority traffic will always be put on the fastest and most reliable link.